[Discontinued] Man I gotta get caught up before all the review thoughts get jumbled in my head. Let's cover this first because it's gonna be quick. Ok, that's a bit rough. 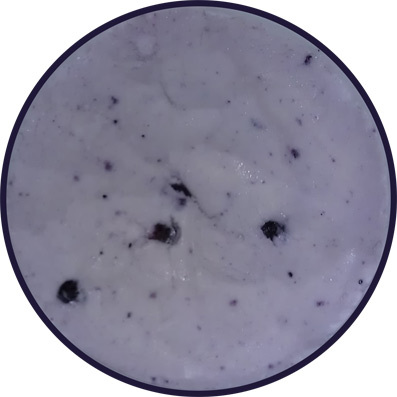 I'm sure plenty of people will love a frozen treat that tastes exactly like nonfat blueberry frozen yogurt. Me? I'm bored out of my mind and I can't even pretend to like it. My wife wasn't a fan at first either, but she says she's slowly warming up to it. I just went to take a third and final run at this flavor but I can't even stand the smell of it. Artificial comes to mind. I sniff it and think of super cheap blueberry muffins rotting on a gas station shelf. I know it's suppose to be a quality product but I just can't get into it, I'm sorry. It's a shame really because doesn't it look cool with it's whole blueberries and blueberry specs? Why does something that looks so real taste so fake? I don't get it.... well, I do get it. I have trouble with non-fat and lowfat stuff sometimes, and I keep trying to be open minded, but it's so hard! Man do I want my five bucks back on this one. Ironic Disclaimer on the pint: "Blueberry isn't a traditional frozen dessert flavor"
I wouldn't give up on fat free stuff until you try ciao bella's adonia line. I feel like they produce quality stuff so maybe it'll be at least decent. I was wondering about this. 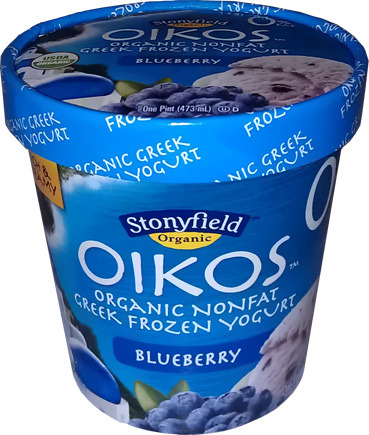 Seems like I could just freeze a blueberry yogurt and save myself some money! wholeheartedly agree. picked this up a few months ago and was appalled. first time I've ever thrown out any quantity of frozen dessert. ATROCIOUS.